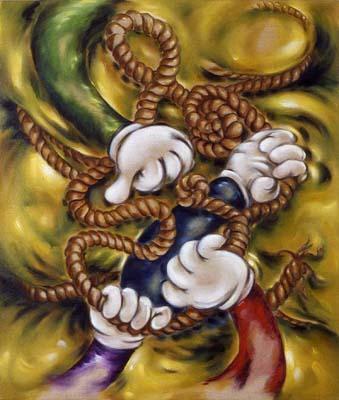 Untitled (Hands with Rope), 2003. Megan Williams’s dark, anxious, and cutely apocalyptic cartoons looked right at home at MoCA’s 1992 “Helter Skelter” show, but the manic characters that populate her paintings and drawings haven’t reared their heads much lately. They’re making a rare appearance in Williams’s first solo show in five years, and though it’s a small offering (just four works), it’s a fine reintroduction. A master of laugh-till-you-hurt images that invite our projections like Rorschach blots, Williams is at her best in pictures of multiple cartoonish hands grappling with a tangle of rope or a spurting hose, and in a larger piece consisting of a cascade of small canvases overlaid by a toy-train disaster scene. She does a fine job of picking up where she left off and, one hopes, is warming up for more.